We like IKEA and shop there often. I like the saying: “Why pay more, if you can go to IKEA”. So for us it was a no-brainer, we wanted an IKEA kitchen. 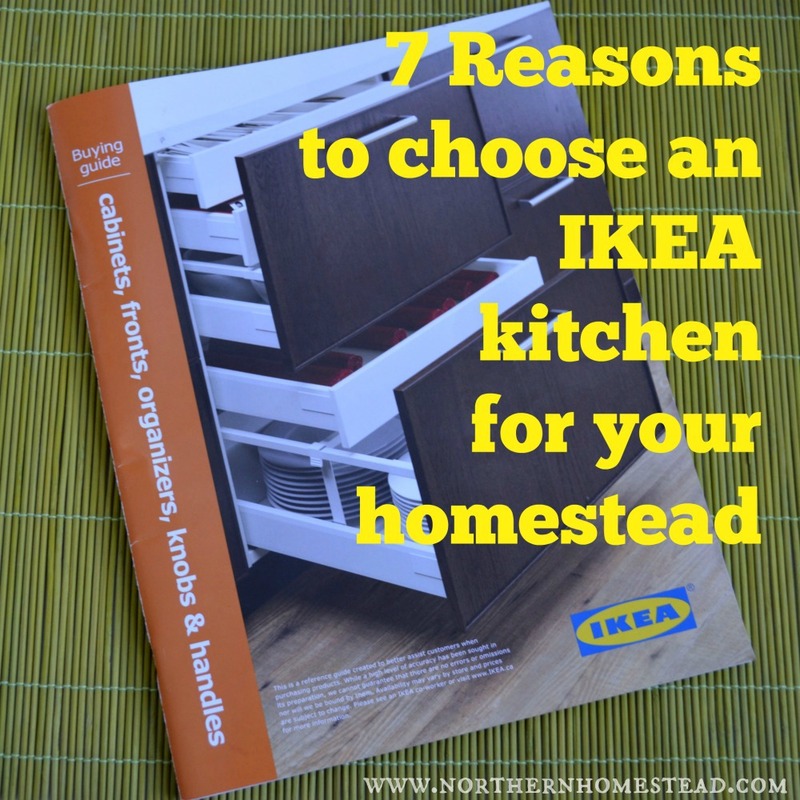 But if you are still considering where to buy your homestead kitchen, here are 7 reasons to choose an IKEA kitchen for your homestead. IKEA stands for Ingvar Kamprad, the founder of IKEA, who was only 17 years old when he started, and who was from a small farm called Elmtaryd near the village of Agunnaryd in the Swedish province of Småland. Two years after starting IKEA, Kamprad began using milk trucks to deliver his goods. The basic IKEA concept is – simple, affordable flat-pack furniture, designed, distributed, and sold in-house. Kamprad felt he was not just cutting costs and making money, but serving the people as well. This simple and affordable concept makes IKEA the perfect fit for people who want to live simply. We are DIY people. If we can make it ourselves, why spend money on it. However, we are not real carpenters. To build the whole kitchen from scratch seemed a bit overwhelming. An IKEA kitchen has the golden middle for DIY people. You only have to assemble it together. Still, let’s make no mistakes about it, to put an IKEA kitchen together is a lot of work. There is a reason for the lower price – you do some of the work yourself. But, if for some reason you are not a DIYer, IKEA does have comparably low installation costs. When we started our kitchen remodeling, we had the goal to stay below 10 thousand Canadian dollars. For fellow Canadians who know what kitchens cost around here, you would probably smile at this. Kitchens are expensive! Plus we did not want a cheap kitchen, but rather lots of features. We were looking for all drawers instead of door cabinets, a carousel, and wall cabinets up to the ceiling. IKEA is the place to get quality for less. The time when IKEA kitchens were cheaply made has passed. Today you will find great quality materials, very functional and practical, which is perfect for an homestead kitchen. No matter if you like natural wooden fronts or easy to clean fronts, IKEA has it all. Personally we prefer the easy to care for version, simply because a homestead kitchen is a busy place and things do get used a lot. On a homestead we like things that last. To get 25 years of warranty is great. We actually own a kitchen appliance as well as pots and pans that are older than that. We like to get quality that lasts, and if a company offers warranty it is even better. This is probably the point that I like about IKEA the most. IKEA is really not just a furniture store. 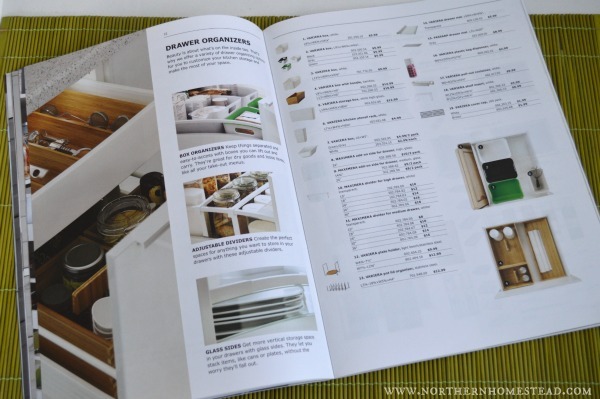 If you buy an IKEA kitchen, you get all the products and accessories that go with it as well. Everything fits together and is meant to fit. You get drawers in whatever size you want, interior organizers, and even a drawer mat made to fit, too. High wall cabinets, and a step stool to reach them. A farm sink, sink faucets, and a colander that fits in, too. IKEA has grown into a huge store with lots of options for a modern look. But it also has kept the charm of a simple country kitchen. That was the look I was after. I can’t say we both were, since Jakob is more interested in the practical side of things. But thankfully at IKEA you can get both without really compromising. I had a blast choosing the perfect apron front sink, faucets knobs, and handles. The wooden counter tops from IKEA finish the cozy, country look. See also how we planned our homestead kitchen here. Guess i’m at the other end of the spectrum. i have yet to see an IKEA cabinet that looked good, but since i am country and won’t step in an IKEA if i can avoid it (or Home Depot, or Walmart, or Starbucks, or…) i likely haven’t seen the country look kitchens you say they have. i’ll believe you. However – today “quality” includes their typical melamine and/or MDF underlayment – and even if that is covered with a real wood veneer i won’t do that. i LIKE the stronger and lighter 11 ply (or 9 ply if you must) birch plywood much more. If one has the ability to pay attention to detail – they can build cabinets. Plans are everywhere, and a few simple tools are not too out of the reach for most people. Face frames are pretty easy if you get a simple chop-saw for accurate square cuts – and a simple Kreg jig and some 1-1/4 pocket screws and some glue. Routers are simple – but if you want a large bit to make a large profile you’re going to want at least a 2-1/2 horse router or more. Clamp your work. It’s basically taking simple steps. Cut out all of your boxes at one time, put them together if you have the room, and go on to the next step. Do that, then keep the process going – slowly. You’d be amazed at what you could get done here in an hour or two per night. Plus if you want you could build that 7’8″ pantry unit with the piano hinges – heck, it’s just more cutting, more hardware, and more fun – plus you get what YOU want… Cost more? Yup – but you can get better glides than IKEA through suppliers instead of retail… and you get to smell the oak or hickory or whatever as you cut it up and put it together. Massive satisfaction all around. Hi Brad, we sure all have different taste and also different abilities to build our own things. I can see the satisfaction, if building your own is going well, however just as much frustration if it does not. Not sure though how you can judge the products of a store you avoid even going to?! Thank you for the encouragement to build an own kitchen if one can do it. I have liked IKEA since I lived in Europe –in the 80s and 90s. When I moved back to the USA, IKEA opened a huge store in Woodbridge, VA. I now live “way north”, but might have to take a trip to Minneapolis. Either way, thanks for the information – your kitchen is beautiful. Thank you Dianne, we like it too. I think it is the same for us, ever since living in Europe for a while and visiting Sweden, we love IKEA.